We recently turned down millions of dollars…$20 million to be exact. And quite honestly, I think it’s one of the best decisions we’ve ever made. Think we’re nuts? We might be. But after reading this post, I think many of you will agree with us…and you’d give up the $20 million too. I was impressed. This, coming from my brother-in-law that had invested all of his money either in the stock market or in real estate and spends very little on pleasure. Heck, the guy is probably worth over a million bucks at 36 years old, and he and his wife and young kiddo still cram themselves in a small duplex because they’d rather have an investment than a true home to call their own. I was a lot like him. 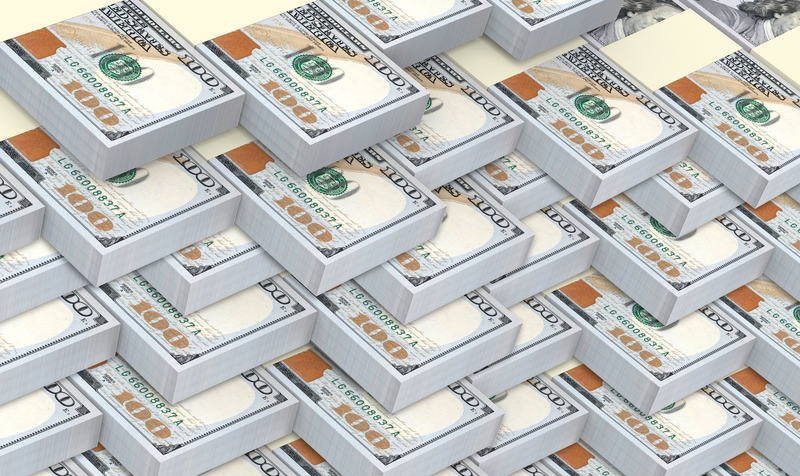 Every decision in my life was made centrally around the dollars…and most of the time, nothing else factored in. Should we go out to eat and experience something new? No, it’s cheaper to eat at home. Where should we go on vacation? Mmmm…let’s go camping. That’ll only cost us $200, max. 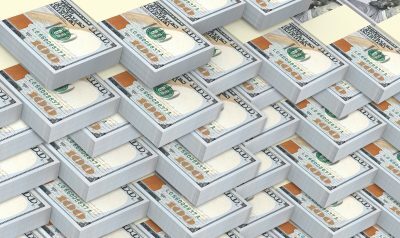 By age 33, I was newly married and my wife and I had already built up our net worth to $600,000. 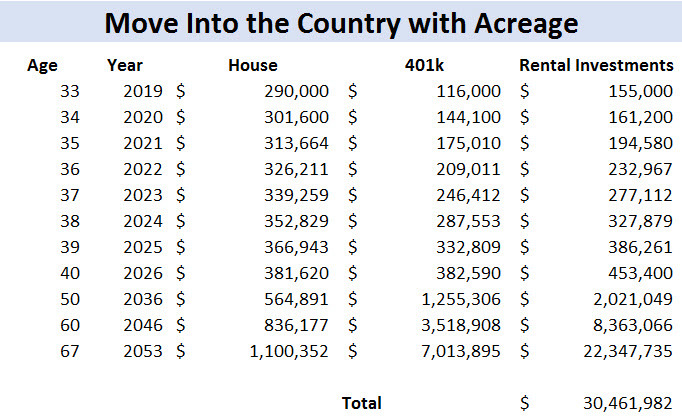 We were on track to be millionaires by age 37 and (get this) by continuing to invest heavily in the market and real estate, we would likely be worth $50 million by the time we turned 67 years old. Seriously. Here’s the table of calculations I put together. The numbers really start to ramp up after we’re 50 years old. What could we do if we had 50 million bucks? But…to get there, we’d have to sacrifice and defer many of our enjoyments today in order to get that massive bank account 35 years from now. Sure, $50 million sounds awesome, but is it really worth 35 years of sacrifice? If we would have stayed in our $170,000 house and continued to pump our income into rental properties and our 401k investments, our net worth would just spike unbelievably – to that $50M mark we were just talking about! But you know what? We just couldn’t do it. We just couldn’t live on our small postage stamp lot any more. We decided to make the move to get some acreage. And, by making this decision, we effectively turned down millions of dollars in our retirement. We are still worth roughly $600,000, but our money isn’t working nearly as hard for us now. See above? The numbers changed dramatically. Instead of that $50 million haul, the numbers now only shake out to $30 million. Our primary house appreciates in value by about 4%. The rental properties were earning 15%. That’s a HUGE difference in growth! It cost us money to sell a property and purchase another one. All in all, $15,000 fizzled away in closing costs, realtor fees, and repairs. So, we took money out of our rapidly growing investments to purchase the home, and we’re not able to invest as much because we’re shelling more money into our slowly-appreciating house each year. Because of these simple reasons (that the average Joe would never even consider), our projected net worth just took a $20 million dive. Why would we, after crunching these numbers and realizing we’d be taking a $20 million hit, agree to move forward with this house purchase? Isn’t that just insanity? I mean, that’s $20 million flushed right down the drain! While standing in the kitchen of our old house, we couldn’t help but look directly into our neighbor’s living room that was 10 feet away. It was awkward, disenchanting, and sometimes downright revolting (I’ll spare you the details). Today, in our new place, we stare into our backyard woods and catch glimpses of deer, turkeys, squirrels, and a large variety of birds. We finally have some space between us and our neighbors! And you know what? We’re loving it. In our last house, we lived 1 block away from the hospital. This was great when my wife was going into labor (in fact, with our last kiddo she walked to the hospital). But, it also meant that ambulances and police cars went up and down our street constantly! We were also close to the fire station, the park was right across the street, we were the through-way for buses, and we live close enough to a school that we could actually hear the football games late at night on Thursdays and Fridays. It was great being so central to everything…but the noise pollution just got to us. We were ready for something a bit more serene, even if that meant we had to pay more for it. You’ve heard it before — people are a product of their environment. If you grow up in a poverty stricken area and are constantly told that you can’t amount to anything and the world is against them, you’ll eventually believe it and grow up becoming a nay-sayer just like the people that fed you all that garbage while you were growing up. I can’t say our area was poverty stricken (it wasn’t), but the environment there wasn’t what we wanted to instill in our children. …No thank you. We wanted our kids outside! Exploring, learning, growing their minds on their own accord – not just in school during lecture hours. Our old house wasn’t super small, but it was chopped up pretty good. The dining room was separate from the kitchen, was separate from the front entry, was separate from the living room…Everything basically had its own box. It made a terrible home for hosting parties. Today, we have a house that’s bigger, open, and has plenty of outside space for hosting all kinds of parties. Finally, we’re no longer conflicted with hosting even a small family at our place. It’s time to be more social and to enrich our lives with the company of others. She hid it for a while when we were dating (she didn’t want to look like a total nut job), but my wife absolutely LOVES horses. I catch her looking at them online, through her Facebook feed, and I’m sure she dreams about them all the time (she still won’t tell me if she does ;))… I don’t know anything about horses, but I love my wife and if she’s happy, then I’m happy. And you know what? She’d be happy with horses. In fact, she’d be elated. SO, by having 6 acres, we now have the option of clearing some pastures and buying some horses! We might not pull the trigger on this immediately, but just by having the option and getting out to the country, my wife is already more pleasant and at peace. But through this process, I’ve learned that YOLO isn’t always a bad thing. Yes, we effectively turned down millions of dollars by purchasing a house in the country, but would we have been happy living in the city with no space, all that noise, and an environment that we hated? I highly doubt it. In our old home, we had about 1,400 square feet of living space. Honestly, it was totally fine. We’re not complaining. BUT, it would have been so nice to have the option of adding more square footage down the road. In our new place (I keep saying new…keep in mind that our “new” house is 50 years old), we already have 1,900 square feet (so 500 more than before), AND there’s about 900 square feet in the basement that we could finish off. Plus, we could build another 500 square feet above the garage if we ever wanted to make a master suite for ourselves. This one is worth about a million bucks all on its own. Instead of having to drive 15 minutes to the beach (I know, I know, woe is us…), now we can bike to the beach in about 5 minutes! And, we have the option of about 3-4 beaches instead of just one. Plus, there are so many hiking trails around. We’ll never run out of things to do outside! Alright, I’ve been dying to talk about this one, and you’ve honestly probably picked up on it already. Yes, we turned down millions of dollars…but we’re not talking about $20 million or nothing here. We’re talking about either $50 million or $30 million. Okay…what’s the real difference?! To us, absolutely nothing. In our retirement, we’ll likely stay living in this house and just travel on occasion. I doubt our lifestyle will ever inflate. It’s just not who we are (and I love that about us). I figure we could continue to live comfortably on $50,000 a year in today’s dollars. 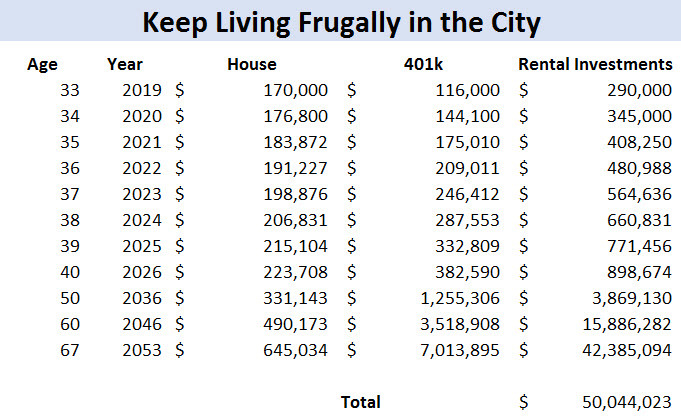 This equates to roughly $200,000 a month when we retire (fricken inflation), which means that we’ll need to have about $3 million in our nest egg. Sooooo, if we have $30 million…I think we’ll survive. Honestly, we’ll probably just decide to keep buying things for today (like a barn and horses for instance) that will knock that $30 million number down even further. And you know what? That’s okay! There’s no sense having millions more than we actually need in retirement. That just means we didn’t live enough in the past and present! So far, I spouted off about 2,000 words in this post. What’s the point? What am I really trying to say? Some of you out there… you’re excellent savers and investors. You’re in your mid-30’s and you’re already millionaires…which probably means that you’re on track to have $50-$100 million in retirement. That’s great and all, but don’t forget to ask yourself, “Why?”. What’s the real purpose of having all that money in the future? And what are you giving up in your life today to get there? To us, it wasn’t. There are better experiences that could be lived today while you’re healthy and agile than when you’re crippled and potentially dead in the future! Yes, it’s important to save, but don’t forget to also live your best life today!! Would you have turned down millions of dollars in our situation? Have you already done so in your life? 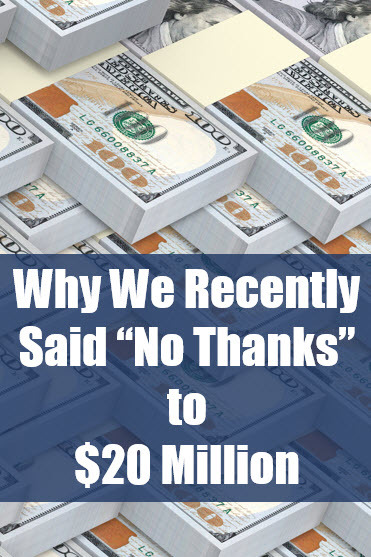 The post Why We Said “No Thanks” to 20 Million Dollars appeared first on Life And My Finances. Previous Previous post: Is Your Risk Tolerance Too High?